Apple's current headquarters are located near interstate 280 and De Anza Boulevard, an address depicted in the company's Maps icon for iOS. The existing six-building campus is ringed by a road the company named "Infinite Loop," which itself is surrounded by a series of parking lots. Apple's new Campus 2 project is located about a mile east, visible at the top of the map in this Flyover view, just past the next freeway interchange. Once completed, Apple will migrate about 12,000 workers to the new site, but will also retain its existing Infinite Loop headquarters and other offices. Some employees have already been briefed as to whether they'll be making the move or not. Apple's current 850,000 square foot main office complex was completed in 1993, allowing the company to centralize its operations from a variety of rented office space locations formerly spread around Cupertino and surrounding areas. Apple also operates a series of other offices to the south and on the west side of de Anza along Valley Green and Bandley Drive, in addition to a number of other locations scattered around the area. Over the past decade, Apple has been aggressively expanding. Back in 2005, a report by Silicon Valley Business Journal noted that the company had "gobbled up" a series of offices in the area, then amounting to 2 million square feet of space. The entire city, the report noted at the time, had less than 10 million square feet of commercial space in total, about half of which was offices and the rest being research and development buildings. With occupancy rates at 8-13 percent, Apple was having trouble finding enough space even then, and was seeking out new space covertly in order to avoid being charged more by landlords aware of Apple's predicament. "Apple is very quietly going around and taking 20,000 feet here and 30,000 feet there and really doing it quite quietly," the report cited real estate broker Jim Beeger as saying. "Ironically, a lot of these buildings Apple moved out of in the 1990s." We've rented every scrap of building we could find in Cupertino In 2006, Steve Jobs addressed the Cupertino city council, saying that Apple's employees were now spread around "thirty other buildings now and they keep getting further and further away from the campus." He added, "We've rented every scrap of building we could find in Cupertino." "We'll probably get larger still," he noted. Four years later, Apple's desperate appetite office space had grown even greater. 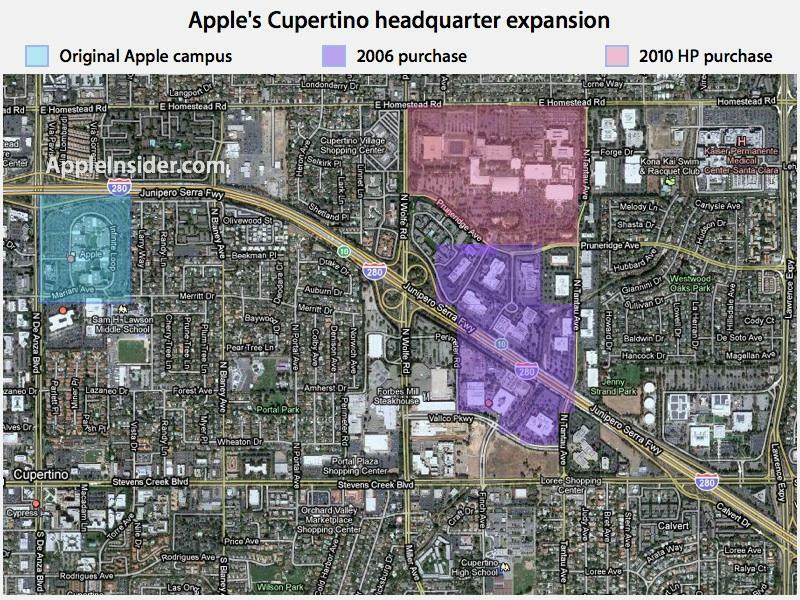 In 2010, the company lucked out when HP decided to sell its large Pruneridge Campus, across the street from the land Apple already owned. Apple's acquisition of the land resulted in a combined 148 acre plot capable of accommodating a huge new campus. Just over two years ago in late 2010, Apple's head of Public Relations Steve Dowling said of the company's expansion plans, "we now occupy 57 buildings in Cupertino and our campus is bursting at the seams. These offices will give us more space for our employees as we continue to grow."